Sometimes life’s most precious of gifts can come in the oddest of packages. Little did I know several years ago that the mean-spirited lovebird I was about to take on would come to bring me such joy and teach me a valuable lesson in life. I have always been a bird person, so it was not that unusual when a friend asked if I would want her peach-faced lovebird. She no longer wanted the bird because it would always attack her other bird. Even though I had never owned a lovebird, I agreed to take in the hostile little creature. And hostile she was. No matter how kind and caring I was towards her, she would take every opportunity to attack me. I ended up having to use a padded glove to feed her because she would viciously bite my hand and cause serious damage if I didn’t. At first, I thought, “what have I gotten myself into”. Despite the birds bad-tempered behavior, I could not help feeling sorry for her when I noticed that she was laying eggs in the bottom of the cage. Since she had no nesting materials, and no mate, the eggs would roll around on the bottom of the cage until eventually they would become so rotten that I had no choice but to remove them from the cage. That particular exercise required two people since Rainbow, as we would call her, was particularly vicious when her eggs were involved. Eventually I purchased Rainbow a mate. I admit I was a bit worried, since at first I was not sure whether she would just bite the poor new birds head off. I introduced her to the new bird slowly and luckily for it, Rainbow approved and the bird got to keep his head. In fact, they got along so well, I would soon learn why people referred to them as lovebirds. I bought the happy couple a nesting box and just crossed my fingers; unsure as to whether I had done the right thing. The first two batches resulted in no babies and I was starting to wonder whether the mate I had chosen was really a boy bird. But, one day I peeked in the nesting box and saw the most disgusting site. Baby birds are not that cute. They are terribly small and have no feathers at all. They hardly resemble a bird. I admit I was a bit shocked the first time I saw two of them squirming around in the bottom of the nesting box. My initial instinct was to remove the babies from the box and try to hand feed them. Fortunately, I came to my senses and quickly realized that the birds knew much more about bird rearing than I did. Even though looking at them was a two-man job and quite an ordeal, I jumped for joy every time I looked in the box and saw they had gotten much bigger. Within six weeks, the tiny babies were as big as their parents and I now had four lovebirds. Unfortunately, Rainbow was not done. As soon as the new babies were weaned she had laid four more eggs. I knew I was in trouble since the large cage they were in could barely support four birds, let alone any more. Luckily for me, my generous husband was a wonderful handyman and he built me a custom aviary that attached to the house. I thought I had died and gone to heaven. 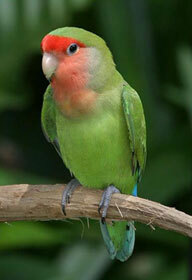 I now had my very own lovebird population and an aviary that I had always dreamed of. Of course, it was not long before I realized that the lovebird factory was not stopping. I soon had ten birds and more were on the way. Even the aviary was not large enough for this many birds. At first, I attempted to sell the babies to a local pet store, but I soon learned that lovebirds do not make good pets and very few people want to buy them. No one wanted to take my extra lovebirds, even for free. It was then that I started to implement an optional release program. This involved me periodically opening the cage door and letting the birds fly out. I figured, or rather hoped that some of the birds would try to come back. You see, over the years accidents would happen and a bird or two would get loose. Even though the birds initially flew away, they would always return in a few hours to the outside of the cage, begging to be let back in with the others. At first this plan worked well and the bird factory, which I now affectionately call, “The Loveshack”, only required that a release occur once every few months. Most of the birds would return and I just assumed that the ones that did not return had gotten a better offer. However, I noticed that the birds were growing restless. Right after they returned from a release, they started flying about the aviary more than usual and seemed to almost be pacing the fence; the way a lion at the zoo does. This bothered me greatly. Even though I enjoyed watching the birds grow and establish their very detailed social structures, I did not want to be the one who restricted their freedom. After struggling with the problem for a few days, I finally mustered up the courage to get out the wire cutters and cut a small opening in the cage wall. As you would expect the birds all left immediately. Even the new babies, who only had just learned to fly. I was not sure if they would return, but I was sure I had done the right thing. I now spend my days giddily watching as my lovebirds fly all about my neighborhood. They act like they are kings of the forest and boss all the sparrows, and even the squirrels around. I guess they figure their beautiful colors, which are so unlike any of the other birds around this area, give them a right to be a little cocky. The birds are beyond happy and every night, they all return to the aviary to sleep. The act of letting the birds go has stirred other emotions in me as well. As humans, we tend to build up mental cages around us. We mistakenly believe that because we are smart, we know what is best for animals. As parents we often make the same mistakes with our children. Rather than setting them free when they are ready, we hold on to them too long and try to protect them from the world. I know that this experience has taught me to think a little differently about all the things I try to protect and to question who I am really protecting. I hope my story does the same for you. Sara Morgan is the author of No Limits: How I escaped the clutches or Corporate America to live the self-employed life of my dreams". For more information about Sara and her book, visit www.nolimitsthebook.com.